Ground the almonds in the food processor until fine. Add the flour, salt, and sugar. Pulse a few times to mix. Add the COLD butter and shortening cubes and pulse until the mixture resembles peas. Add the amaretto and 1 tablespoon of cold milk. Pulse again until the dough comes together. Add another 1-2 tablespoons of milk if needed. Dump the dough out onto a sheet of plastic wrap. Separate into two equal pieces and flatten into two disks. Wrap each disk in plastic and refrigerate for at least 30 minutes. Meanwhile, mix the blueberries with the following 5 ingredients and set aside. Preheat the oven to 425 degrees F. Move to racks to a lower and middle position. Flour a work surface and roll out one disk of dough in a 12 inch circle. Fold the dough over the rolling pin to transfer it to a 9 inch pie pan. Repair any cracks. Crimp or pinch the edges. Roll out the second disk of dough and cut out shapes with a floured cookie cutter. Pour the berry filling into the pie crust and top with 2 tablespoons of butter cubes. Arrange the dough shapes over the filling. Whisk an egg with 1 tablespoon of water and brush the egg wash over the pie crust. Place the pie on the lower rack and bake for 15 minutes. Lower the heat to 375 degrees F, and move the pie up to the middle rack. Bake another 35-45 minutes—until the crust is golden brown and the blueberry filling in bubbling. If the pie crust browns too quickly, cover it with foil. Once out of the oven, resist the urge to cut into the pie and have a slice. The pie needs to cool to room temperature for the filling to thicken up! It usually takes about 2 hours! 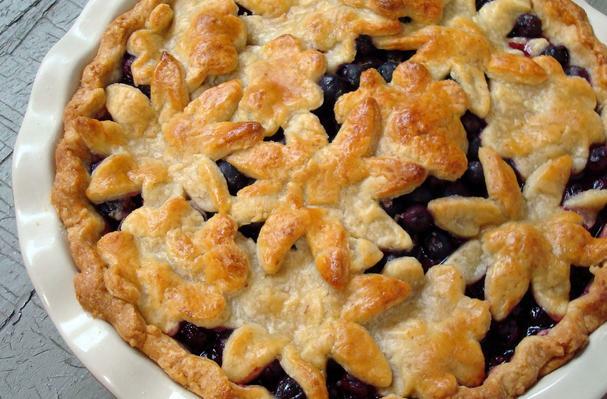 This particular blueberry pie is a classic rendition. I like to keep such nostalgic dishes fairly straight forward. The only artist license I took was with the crust. I tweaked my favorite pie crust recipe by incorporating ground almonds and amaretto! The almonds create a slightly more brittle, but exquisitely flaky crust and the amaretto deepens the sweet, nutty flavor. It was a superb crust, if I do say so myself!